This unusual map of Cape Cod was drawn in 1932 by the Cape Cod architect Walter M. Gaffney. This particular map was drawn by Hyannis architect Walter M. Gaffney during the Great Depression. According to his daughter, Gaffney issued this map to make supplemental money while the architecture business suffered a downturn. This is considered a 'figurative map' or a 'decorative map,' and reflects a style that first began to appear around 1910. 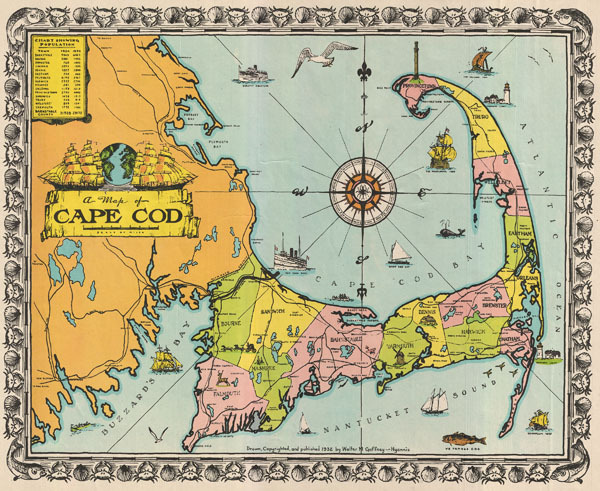 As a map its intention is not so much to provide direction as to illustrate the character, famous places, and historical appeal of Cape Cod. Cartographically speaking, this map style most likely draws its inspiration from late 19th century 'tourist maps' and 'railroad maps.' Tourist Maps, common to major cities in Europe (usually Paris or London), included profiles of notable buildings and monuments and were designed to help foreign tourists identify and navigate to the most important sights. 'Railroad Maps' are a related genre more common to the United States. During the latter part of the 19th century railroad boom, railroad companies began issuing decorative route maps extolling the virtues various regions and their accessibility by rail.